No charges have been filed yet, but the police investigation into the spectacular collision between a Norwegian frigate and an oil tanker last fall is now targeting three people. They’re all believed to have played “central roles” in the maritime drama. “These are the three who were responsible for the three entities involved,” Ole Bjørn Mevatne, prosecutor for the West Police District that’s responsible for the investigation, told Norwegian Broadcasting (NRK). The three entities include the frigate KNM Helge Ingstad, the tanker Sola TS and the marine traffic station at Fedje, which was responsible for monitoring vessel movements in the area northwest of Bergen where the collision occurred in the early morning hours of November 8. Metvatne’s comments came just after the state accident investigations board (Havarikommisjonen), which is responsible for determining the cause of the collision, conducted a re-enactment of the collision earlier this week. It involved the police, state oil company Equinor of the terminal from which the tanker was departing, the coastal administration agency Kystverket and the Norwegian Navy. The people now officially viewed as suspected of contributing to the collision include the pilot on board the tanker Sola TS, the duty chief on the bridge of the frigate and the man who was on duty at Fedje and responsible for monitoring traffic in the area. Mevatne told NRK that the pilot is suspected of violating navigation regulations regarding how the tanker was lying in the water while sailing fully loaded from the Sture oil terminal, and whether the pilot issued the correct signals to the frigate sailing towards the tanker. Tapes of urgent conversations between the tanker and the frigate reveal how the pilot was desperately trying to get the frigate to turn as it sailed towards the tanker at high speed, but the frigate did not respond quickly enough. A preliminary report from the accident investigation board revealed that the frigate’s crew seemed confused by the lights of both the terminal and the tanker, and mistook the tanker for being part of the terminal itself. The crew on the bridge of the frigate had just undergone a duty shift. The duty officer in charge of the bridge was also responsible for the seven crew members on the bridge in connection with the collision. “Navigation regulations also play a role here, along with whether those on the bridge were negligent and caused the collision that could have led to loss of life,” Mevatne told NRK. The man monitoring marine traffic in the fjord that night is suspected of dereliction of duty. “He had independent responsibility as traffic leader in the area,” Mevatne said. 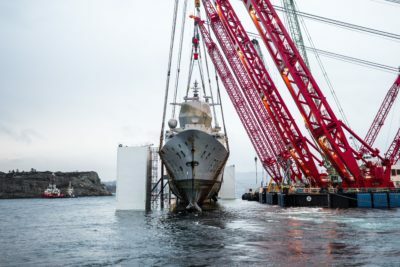 “Fedje (the traffic station) is supposed to serve like traffic police in the area.” There was an apparent lack of response, however, to how the frigate, which was returning to its home port in Bergen from participation in NATO exercises last fall, and the tanker were on a collision course. The duty chief on the frigate refused to comment, referring all questions to the defense department (Forsvaret), which also declined comment on the suspicions or whether the collision has had any consequences for the duty chief’s position and daily work. The head of the Fedje traffic station, Arnt Runar Sævrøy, said they were aware that one of their employees was under suspicion. “This isn’t new to us,” he told NRK. “Other than that, we have no comment.” A defense attorney has been appointed for the pilot on board the tanker, who also had no further comment. Defense Minister Frank Bakke-Jensen, who has political responsibility for the Norwegian Navy, has also declined comment on who was to blame for the collision. He has chosen instead to praise the frigate crew’s quick evacuation of the vessel before it sank, and express relief that no lives were lost. The captain of the frigate was sleeping at the time and both he and the frigate’s crew have been shielded by the Navy. The captain recently broke his silence and offered his version of events, but was not on the bridge at the time of the collision.